Ask 5 people, you will get 5 different answers. That’s because people will tell you that the best baby stroller travel system is the brand they use, but is it REALLY? Before you end up making a purchase that you may regret, take a look at what our research has discovered about the supposedly best baby travel systems. Which baby stroller system is the best? The SAHM readers have spoken! These are the top 5 Baby Car Seat Stroller Combo Travel Systems for 2018! I have my own personal preference, but we think what our SAHM readers say is MUCH more valuable to you. Our readers picked these 5 Stroller Travel Systems as the best options for a new mom. They made some great picks this year! Keep reading to see their reviews and compare prices. In a hurry? This one is the most popular. The Britax B Agile & B Safe 35 Travel System is an excellent car seat travel system. And it happens to be my favorite choice as well. This stroller is precisely made for those parents on the go with their babies and other kids in tow. Folding it is super simple and it fits in the most trunks easily. The frame is made of an aluminum that is very lightweight and therefore easy to lift and carry as well. So, which travel system is the best? Well, the first question you may be asking is: “Why do I need a Travel System over a separate car seat and stroller?” Everyone that is expecting baby or has a baby needs a car seat. All parents need a stroller as well. They are two of the most essential items on a baby registry. While your baby is still an infant you will need the convenience of a stroller that fits a car seat. That’s where the functionality of a travel system comes into play. Not all child car seats fit into strollers. For your convenience the car seat comes directly out of the car base and snaps right into the stroller base. It is that easy. No taking the baby out and unfastening and refastening in the parking lot of target. You know what they say? Never wake a sleeping baby. This system will help you tremendously in that department. They are usually lightweight and easy to fold and unfold in the back of your car with one button. As for myself and my family? 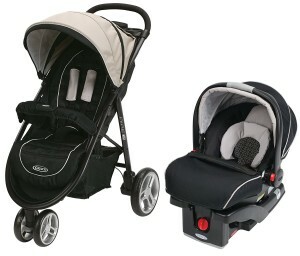 I bought and used the Britax B-Agile & B-Safe Elite Travel System. I actually still have the stroller that I use all the time for my 4 year old. I have been very happy with my purchase. It is so compact and lightweight that moving into and out of my vehicle has been super simple. The ease of maneuvering with a 3 wheel stroller is incredible especially for tight shopping areas. It is so easy to fold up and unfold from the car. I love it and I would recommend it to anyone with a baby on the way. When comparing stroller and car seats alike, you will find that there are SO many available features and options that it can make your head spin and make buying a difficult experience. There are a lot of things to consider before buying, but at the end of the day, it comes down to quality and price. We all want to know we are buying a high-quality product for the BEST price possible. It would definitely be worth taking a look at the great deals before buying. How do you pick the right stroller for you? There are many travel systems to choose from- most will work for anyone. Some are just much better and easier on us. There are 3 basic or standard stroller designs: 4-wheel stroller (most popular), 3- wheel strollers, and the Jogging Stroller. Do you need 4 wheels or can you go with 3 wheels? Ease of movement and maneuvering through narrow spaces calls for a 3 wheel system. Do you need a more stable base in case your 4 year old decides to hitch a ride? You would probably want to look at the 4 wheel strollers. Do you exercise with your baby in tow or jog- you may want to look at a jogging stroller system. The stroller and car seat combo with 3 wheels is a great option for people who want to be able to maneuver a bit easier and don’t have as much room to move. The parents that would love the 3 wheel option tend to be the ones that are using it for getting around in the day to day activities or errands, not out exploring the world. If you do not need the 3 wheels and would be fine with 4 wheels, the 3 wheel stroller combos tend to be more expensive and do not come in as many designs and colors as the 4 wheel travel systems. The car seat stroller combo travel system with 4 wheels is the most popular option of travel systems. Families looking for a system to grow with them. They can be easy to use and navigate as well. The 4 wheel stroller system provides a more sturdy foundation and stands solid to the ground. They normally have a lot more accessories, but in turn also can be a bit bulkier and heavier. They also take up more space in storage or in your car. 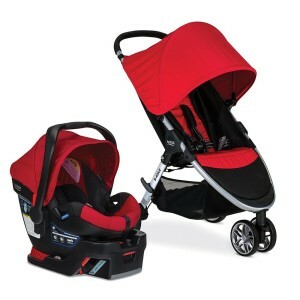 For those of you who want to get back into shape after having the baby may want to look at the Jogger Travel System. The joggers combos are solid and usually lightweight. They also maneuver around very well. The joggers are going to tend to be on the more expensive side of travel systems. They are meant to be driven on a rougher terrain or road all the while allowing the baby a smoother ride. The Jogger normally has 3 wheels and soft tires for cushion. These travel system are built for one thing in mind, Jogging. Even though they are not a necessity, some parents insist on having one of these as well or instead of a regular travel system combo. After much research. 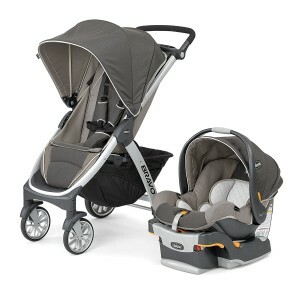 We found that the best Jogger Travel System is the Graco FastAction Fold Jogger Travel System. Benefits of a travel system, stroller/carseat combo. Safety – Everyone wants a safe car seat and stroller for there new baby. It would be easier to research one item rather than two. The travel system gives you the stroller, car seat, and car seat base. What do I look for in a travel system stroller? You are looking for weight, height, storage, carrying capacity, compartments, ease of folding and unfolding and especially safety. What do I look for in the car seat and car seat base? You want to make sure they have all of the following: 5 point harness, Side impact cushion, lightweight, handling capability, infant inserts that can be taken out and cleaned, a latch system (click it) and one that fastens into stroller and base with ease. Our Top 5 Picks for Best Baby Travel Systems! When it comes the best baby stroller and car seat travel system with best reviews, these are the ones to choose from. All are excellent and affordable. This travel system is a B-Agile Stroller and B-Safe 35 Elite infant car seat combination. The best part of the new version of this system are the lightweight stroller construction and unbelievable maneuverability. The 3-wheel arrangement and rotating front wheel makes it very easy to fit through narrow spaces. Moving the travel system strollers through stores is very simple even with the use of only one hand. Which lets face it Mom’s usually only have one hand to work with if you have more than one kid. This stroller is precisely made for those parents on the go with their babies and other kids in tow. Folding it is super simple and it fits in the most trunks easily. The frame is made of an aluminum that is very lightweight and therefore easy to lift and carry as well. Thank goodness for a great design and lightweight structure. Day trips and vacations with this travel system will be much easier and you can focus on other things. The stroller does have a reclining seat with a flat position which is helpful during a naptime. The seat has great air flow due to the mesh window. It also has a large canopy with UV protection for your little one. 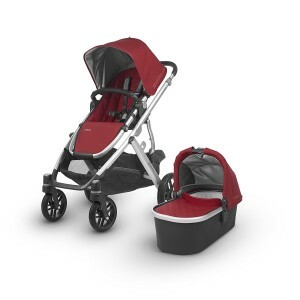 The Britax B-Agile is just one component of this amazing travel system. The other is the B-Safe Elite infant car seat which provides the safety for your baby while traveling in the vehicle. The B-Safe 35 Elite is designed to protect your baby during an accident and cushion impact. The car seat has specific shape that is deep with curved sides meant to keep your baby in a stable position and minimize movement from side to side. There is an adjustable back and head protector that is based on your baby’s height. This infant car seat has many great features, but one of them stands out to parents which is the adjustable harness that you not have to re-thread. Do you like this travel system the best? This is one of our favorite travel systems. The UPPAbaby Vista with infant car seat. It is a very modern and sophisticated stroller and car seat travel system. Definitely top for quality and style. The Vista is known for its multi-functions and versatility. It can be used for up to three kids at the same time. The stroller has many features which make it high on the quality scale. It has rubber wheels which allows for a smooth ride. Especially for city strolling, but can also handle a rougher landscape as well. It has a soft padded seat with multi position recline and 5 point harness. The canopy is made of a specific material that protects your baby from harmful sun light. It also has an adjustable handlebar for different heights. This stroller has one of the largest storage baskets on the market. It is one of the more expensive stroller systems. Although, if you want an all in one stroller that grows with your baby and expands with your family this is it. The UPPAbaby Vista can be a double stroller as well as a triple stroller. It can hold a second and third so you will not have to purchase another. It is extremely durable and will continue to benefit you for years. The Graco Click Connect Travel Stroller makes traveling with a baby easy and convenient. It has a lifestyle stroller and a snugride snuglock infant car seat. The travel system allows for children birth to 50lbs. This travel system includes the infant car seat, car seat base and stroller. The infant stroller has a 4 position seat recline and a 3 position adjustable leg rest. It also has a height adjustable handlebar and one handed fold capability. The accessories are endless with the large canopy, child tray and cup holders as well as a parent storage and large under seat basket. 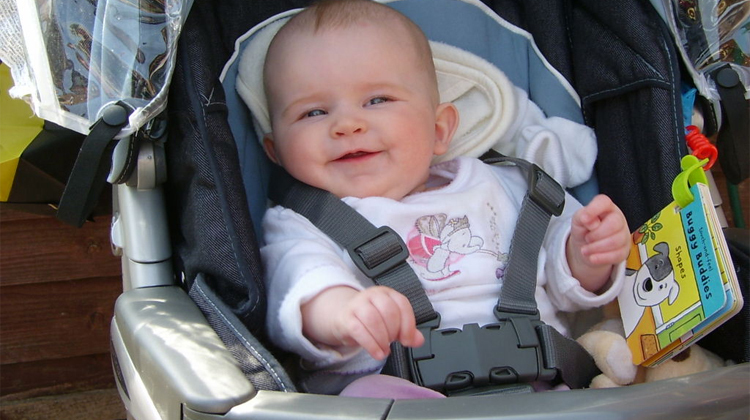 The infant car seat has a 5 point adjustable harness and snuglock technology. The safety is always a must when it comes to your little ones. That is why this car seat has a safety core impact absorption feature that includes a frontal crash and side impact protection with energy absorbing foam. The click connect is a one step technology to attach the car seat to the base or stroller. 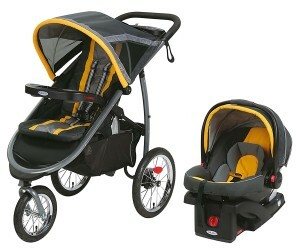 The Evenflo Pivot looks very similar to one of the previous strollers except it is a lot less expensive. It is three times less expensive as the Vista. This travel system is quite the deal. The car seat comes with a rollover tested capability and will hold a baby from 4 lbs to 35 lbs. The seat is reversible in the stroller which is a huge plus. Sometimes babies really want to see where they are going and some just want to see their Mommy’s. The Evenflo Pivot has 6 modes of use that adds to your options. The stroller has really nice cruiser tires that allow for a smooth ride. It also has a full coverage canopy that helps in all weather conditions. This cheap travel system is easily transported and does not take up a lot of space. It is easy to fold and one of the best lightweight strollers for carrying. This is definitely a great choice if you are looking to save some money. It will not last you as long as some of the others, but it is comfortable and safe. The maximum weight for this stroller system is 50 lbs. 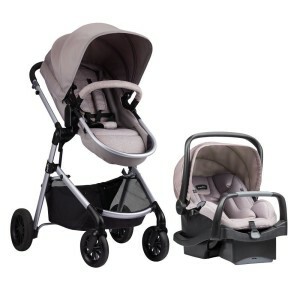 The Chicco Bravo Trio is yet another great travel system. The transition of the car seat from stroller to car and back with ease is second to none. The stroller folds very easily and is very narrow for fitting in tight spaces. The features are very effective on this stroller system. It has an adjustable canopy that is also removable. The handlebar is adjustable as well. The seat on the stroller is removable as a function to allow for the infant seat to snap in to the frame. You can also recline the seat with one push of a button. The Chicco Bravo Trio has foam filled wheels that provide a very comfortable ride for your baby. The best features that stands out from the rest is the compact folding feature. It is perfect for small cars or small storage spaces. The Chicco Bravo Trio infant car seat comes with a KeyFit 30 which clicks in with ease to the stroller or car seat base. The car seat also has a very user friendly handle. This travel system is also known for its safety standards. It protects your baby during an accident by absorbing energy. The Chicco Bravo Trio Travel System has hundreds of positive reviews on Amazon. One Con: This travel system has pretty small and plastic wheels that are probably better used in the city on less rough roads or terrain. It also usually requires both hands for steering the stroller. Finding the best baby car seat and stroller can be a very difficult decision. There are numerous stroller brands to choose and it can be hard to narrow down without help. They have so many that have such slight differences to of course ones that are extremely different. If you are expecting or are first time parent it can be quite confusing and overwhelming. Looking at reviews and talking to friends and family. The best option is out there. Let us help you! One stop shopping. Travel systems are for the parents that are constantly on the go. They need to move the baby in and out of the car and travel with ease. The less movement the better the infant will sleep. The travel system comes with a car seat, car seat base and stroller that are all made to connect and click on easily.